For months, Marvel Studios has been asking fans to choose a side between Team Captain America and Team Iron Man. For a theater full of young volunteers, it’s no longer an open question. 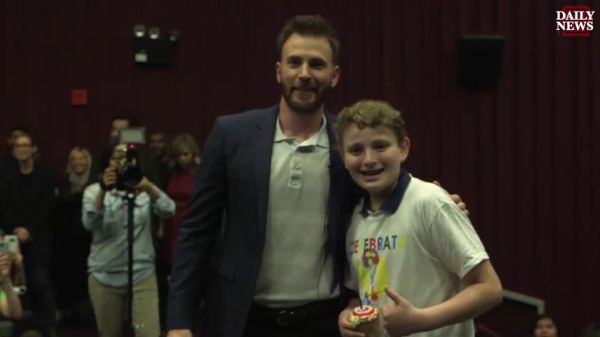 Chris Evans turned everybody into huge Captain America fans when he arrived prior to a charity screening of Captain America: Civil War and joined them in wishing a happy birthday to a 13-year-old who had just made a major donation to their cause. The special screening was put together by the New York Daily News and Disney to honor a pair of charities in the new York area, GenerationOn and CelebrateU. CelebrateU’s focus is to provide birthday parties for less fortunate kids in shelters, so it was fitting that the organization stop and take a moment to wish one of their volunteers, Archie Silverstein, a happy birthday of his own. What nobody was expecting was that Chris Evans would arrive and join in the singing of "Happy Birthday" complete with a cupcake for Silverstein done in Captain America shield icing. The roof comes off the place when they realize who just walked in. In addition to his own presence, Chris Evans brought Captain America toys for every kid in the theatre, donated by Disney. One can only imagine how excited the kids already were to see Captain America: Civil War early, but to have Captain America himself show up is a whole new level of excitement. Evans, for his part, looks equally thrilled. He gets to be a special moment in the kids lives just by being there. It’s a great way to give back. He’s not the only actor who seems to love doing something nice for kids. It’s a great thing to see. Chris Evans did take a swipe at Iron Man, daring him to show up. We don’t think Robert Downey Jr would have had a problem doing so. We’ve seen that he tends to do his part to give back as well. It’s great to see kids doing great work like this. It’s equally wonderful to see organizations like Disney take the time to recognize them for all the work that they do. Giving them the screening would have been nice enough, but the added benefits of the guest appearance by Chris Evans (we’re assuming Disney is who called him in) and the toys is even better. Evans told the NY Daily News that it reminded him of the time he got to meet and get an autographed action figure from his idol, Hulk Hogan. We can only hope that Chris Evans never becomes Hulk Hogan.